The shock of 1974's Watergate scandal not only brought down a president, but brought home to the American public the potential for abuse in the political system. Watergate led to a rash of Hollywood conspiracy movies - notably The Parallax View (1974), Three Days of the Condor (1974) and Winter Kills (1979) - which tapped into newly unleashed anxieties about unharnessed State power. 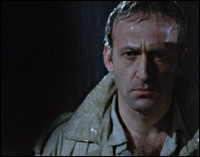 This flowering of the conspiracy genre found an echo a decade later in Britain, with the feature film Defence of the Realm (d. David Drury, 1985) and television series like Edge of Darkness and A Very British Coup responding to widespread political unease and cold war anxieties. But as is the nature of conspiracies, the story neither starts nor stops there. While the American conspiracy narrative borrows from the films noirs of the 1940s and '50s, the roots of the British variant can be found in Alfred Hitchcock , particularly his The 39 Steps (1935) and Sabotage (1936), and in wartime films like Went the Day Well? (d. Alberto Cavalcanti, 1943). But whereas those films identified dark forces - enemy spies, anarchists or Nazis - seeking to undermine the British State, in later conspiracy drama the dark forces are those of the State itself. In this respect, the genre's true ancestor is George Orwell 's vision of a totalitarian Britain, Nineteen Eighty-Four . Nigel Kneale 's television adaptation of Orwell 's novel (BBC, 1954) caused one of the medium's early controversies for its brutality, and became the template for a series of dramas imagining a dystopian Britain in which totalitarianism has overturned democracy. In 1971's The Guardians (ITV, 1971), the backlash against a Britain in social and economic freefall has led to a rightwing dictatorship backed by a brutal paramilitary force. The Donati Conspiracy (BBC, 1973), and its sequel, State of Emergency (BBC, 1975) featured a similarly authoritarian regime, this time under direct military leadership. 1990 (BBC, 1977), as its title suggests, was more explicitly Orwellian, describing a bureaucratic dictatorship characterised by restrictions on freedom of information and the press, overseen by the oppressive Public Control Department. In these 1970s serials, the conspiracy is external to the state, an underground rebel movement struggling for liberty, even if, as in The Guardians and The Donati Conspiracy , the methods the rebels employ are explicitly shown as terrorist. This reflects a decade which saw the leftist activism of the 1960s transmute into more aggressive forms with terrorist cells like Germany's Baader-Meinhof gang, Italy's Brigate Rosse and Britain's own Angry Brigade. In Nineteen Eighty-Four , the power of the state is so absolute that the rebel movement is entirely fictitious, a ruse to unmask potential dissidents. The 'dystopian' branch of conspiracy drama shares characteristics with science-fiction, with a future setting, a preoccupation with the technology of control, and an extrapolation of present concerns ( Kneale 's adaptation of Nineteen Eighty-Four explains that the rule of Big Brother follows a nuclear conflict; in the 1970s serials, authoritarianism is a response to trade union militancy, social unrest and the fear of anarchy). Half in this camp, too, was The Prisoner (ITV, 1967-68). Fantastical and technology-obsessed though it was, however, The Prisoner was - apparently - set in the present, and depicted not a dictatorship but a ruthlessly efficient apparatus of oppression beneath the veneer of democracy. By the 1980s, however, the concerns of left-leaning television dramatists were more immediate, specifically an aggressively right-wing and seemingly immovable Conservative government under the premiership of Margaret Thatcher. A series of political controversies, notably surrounding the trials of whistle-blowing civil servants Clive Ponting and Sarah Tisdall and the attempted (and partially successful) suppression of investigative journalist Duncan Campbell 's Secret Society series (BBC, 1986), exposed a growing culture of Whitehall secrecy and an erosion of civil liberties which compounded existing concerns about the Cold War and nuclear power. Such anxieties demanded a more realistic expression, with a clearly defined present-day setting. Continuing the techno-angst of earlier dramas, Bird of Prey (BBC, 1982) and In the Secret State (BBC, tx. 10/3/1985) explored the arrival of the computer age, with its vast potential for fraud, surveillance and 'counter-subversion'. Both dramas presented archetypes of super-patriotism working within the inner core of the State but quite prepared to undermine both government and citizenry to pursue their visions of a greater Britain. A Very British Coup (Channel 4, 1988) took this idea further still, with the forces of the Establishment - rightwing press, senior civil service, intelligence services - massing to confront and even overthrow an elected left-wing government determined to carry out a programme of unilateral nuclear disarmament. Nuclear power - civil, not military - was the driving force of Edge of Darkness (BBC, 1985), perhaps the definitive conspiracy drama and one of the key television series of the 1980s. Troy Kennedy Martin 's ambitious script captured the decade's key concerns - State secrecy, the British-American 'special relationship', unfettered global capitalism, the risk of an environmental catastrophe - in a deeply satisfying package with strong mythic undertones. As Thatcher gave way to Major, political conspiracy drama became less fashionable, although 1992's BSE thriller, Natural Lies (BBC), indicated that environmental destruction was a growing concern. But in 2003, the six-part thriller State of Play (BBC) proved there was still life in the genre. With a plot revolving around the multinational oil trade, political corruption, murder and sexual intrigue, State of Play looked back to Edge of Darkness while remaining determinedly modern and demonstrating that the New Labour government could inspire the same kind of anxieties as its Conservative predecessors.